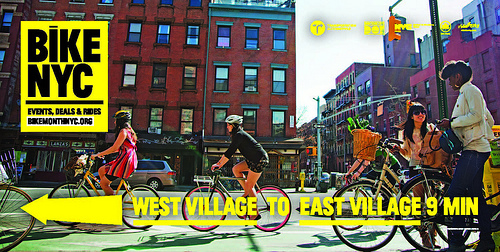 In honor of National Bike Month, New York City's DOT released a series of informational, promotional ads. Photo by nycstreets. May is the United States’ National Bike Month! Check out the League of American Bicyclists‘ open-source calendar for events happening in your area. In the spirit of Bike Month, the city of Philadelphia announced the plan for new North-South bike lanes in the city’s central districts. Washington, D.C.’s Capital BikeShare program is continuing its expansion by way of 25 new stations, according to Chris Holben of the District Department of Transportation. Delhi deployed a new fleet of corporate buses this week. The ambitiously-equipped vehicles contain close-circuit cameras, internal announcement systems, automatic vehicle location systems and electronic ticketing machines. The Five Boro Bike Tour, New York City’s annual group bike tour, presided this past Sunday. This year’s tour was 42-miles in total and included 30,000 bikers. New York City metro cars could be much cleaner, determined the twelfth annual subway the “Shmutz” survey. Wisconsin’s Joint Finance Committee (JFC) passed a budget motion to eliminate all Regional Transit Authorities in the state. The Pedestrian and Bicycle Information Center unveiled their winners for the top “walk-friendly” cities in America. Seattle tops the list. Celebrating both National Bike Month and biking in general, New York City hosted The New Amsterdam Bicycle Show this past weekend. The show featured presentations, discussions, and a smattering of artwork, and vintage and new bikes. India announced plans to introduce new fuel efficiency standards. Auto manufacturers will have until 2015 to increase fuel efficiencies from the current average of 14.1 km/liter of gasoline to 17.3 km/liter. The city of Cleveland presented a waste-to-energy project (MSWE), differing from traditional waste disposal landfills. The proposed Cleveland facility could ‘gasify’ up to 560 tons of trash a day, producing 500 tons of energy pellets. The U.S. Environmental Protection Agency invited small entities—businesses, not-for-profits, and government agencies—to participate in the Small Business Advocacy Review (SBAR) Panels to aid in setting new vehicle emissions standards. University of California at Berkeley’s lab forecasted future transportation growth in China to include an increase in private car ownership by more than 356 million vehicles by 2050, with 30 percent of these new vehicles being electric cars. The San Francisco Municipal Transportation Agency (SFMTA) released a draft of their climate change strategy aimed to reduce the transit system’s carbon emissions. Ray LaHood, the U.S. Department of Transportation Secretary, disseminated that the Obama administration will announce new fuel efficiency standards as early as this fall. Public spaces in Dallas, Texas have become a little more public, with a series of live urban architecture design competitions, called Build a Better Boulevard. A series of neighborhood walking tours are happening in Sacramento, California this weekend. Coined Jane’s Walk USA, the tours have taken place in cities across the U.S. and incorporate elements of urban planning and neighborhood advocacy, as well as urban and architectural history. Form and function come together for public spaces’ seating needs in this newly designed, compact, yet bountifully big seating structure by Sybarite. The University of Cambridge (UK) will take the lead on a $1.46 billion research program on graphene, a strong and lightweight derivative of graphite. We covered possible uses of graphene in building automobile parts in this week’s Research Recap. Nisson’s proposal was the winner of the New York City Taxi of Tomorrow program. Nisson’s line of taxicabs will enjoy an exclusive contract to sell and service taxicabs in New York for the next decade. Fuel cell development found support this week from UK-based ACAL Energy deciding to invest $1.65 million in I2BF, a U.S.-based international clean technology asset management group.